LGM Financial Services Ranks No. 336 on the 2016 PROFIT 500 | LGM Financial Services Inc. LGM Financial Services Ranks No. 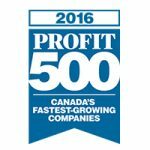 336 on the 2016 PROFIT 500 | LGM Financial Services Inc.
Vancouver, BC (September 15, 2016) – Canadian Business and PROFIT today ranked LGM Financial Services No. 336 on the 28th annual PROFIT 500, the definitive ranking of Canada’s Fastest-Growing Companies. Published in the October issue of Canadian Business and at PROFITguide.com, the PROFIT 500 ranks Canadian businesses by their five-year revenue growth. LGM Financial Services made the 2016 PROFIT 500 list with five-year revenue growth of 157%. A leading provider of best-in-class automotive F&I products, LGM represents the most OEM branded product solutions in Canada. Driven by a vision to revolutionize the consumer ownership experience, LGM combines a consultative sales approach with a strong commitment to service excellence, and an unmatched understanding of market trends and consumer buying habits. Read more on LGM.ca or follow @LGMCanada on Twitter.